Strongwell would like to congratulate Tennessee High’s F.I.R.S.T. (For Inspiration and Recognition of Science and Technology) Robotics team for their performance in the Smoky Mountain Regional Robotics Competition. F.I.R.S.T. was founded in 1989 to motivate young people to pursue education and career opportunities in science, technology, engineering, and math, while building self-confidence, knowledge and life skills. For the past two years, Strongwell has been an avid promoter of those goals within our local community by providing mentoring and materials for these students. This year’s competition was themed “Ultimate Ascent.” The objective of the competition was to design robots which were capable of launching, loading and shooting discs into goals. Overall scoring was based upon team collaboration, disc placement and climbing ability. This year the team was invited into the finals portion of the event. The Strongwell-sponsored team placed 18th out of 50 regional teams from nine states. We would also like to thank: Bristol Compressors, JCPenney, ASME Holston Section, Energy Systems Group, Bristol Tennessee City Schools, Eastman and Lowe’s for also contributing their time and resources in making sure students within our communities are exposed to the high tech meld of combining sport and science through innovation. 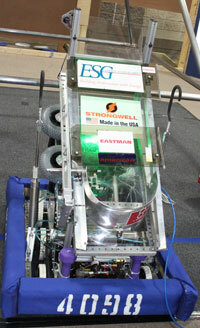 Click here for more information on Tennessee High’s Robotics Team.